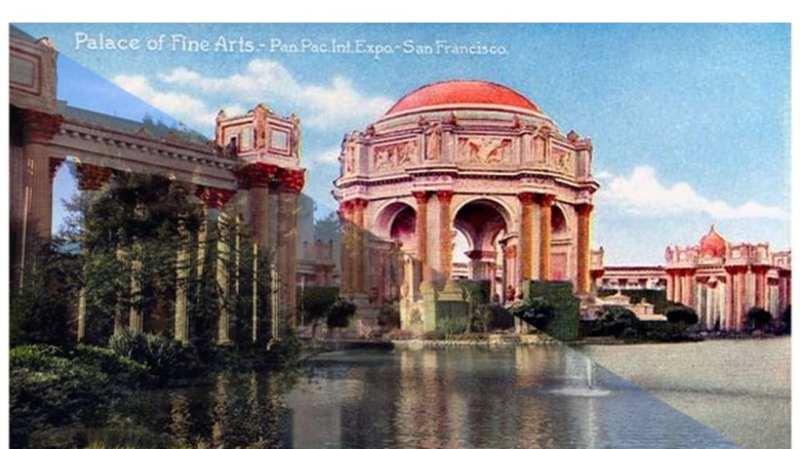 San Francisco's Panama-Pacific International Exposition opened February 20, 1915, nearly 100 years ago. To mark the upcoming anniversary, iPhone app ScenePast Americana collected a slew of vintage pictures from the event and put them next to some current photos. Viewers can scour through pictures of the 630-acre exhibition held in San Francisco's Marina District. There's only one remaining building from the exhibition, so the pictures capture a huge change. To get these side-by-side looks, ScenePast researched fair documents and maps, including this super-incredible interactive map. The palace is the only structure from the fair that remained in its original location. It was one of 10 palaces that were erected for the exhibition. The colonnade and rotunda of the palace were not contructed with durable materials, so the majority of the structure was demolished and rebuilt in the 1960s. The tall building is now completely gone, but you can see a familiar dome in the background. Today, a building housing the Marina Branch of First Federal Savings and Loan Association of San Rafael stands in this location. The giant structure has been replaced by residential buildings. A baseball diamond now inhabits the space where the Amusement Zone once was. All the grass has been paved over, and homes have been constructed. You can now find a beautiful elementary school in place of the fair structure. No trace of the service building remains. Here's another view of similiar looking apartments. The pavilion is gone, but at least now there's a good view of the bridge. The village has been dismantled, and now there is a small park in its place. For more cool comparisons, you can download the app here; for more information about the fair's centennial, check out PPIE100.org.